Last week, University of Alberta President Indira Samarasekera issued a “Call to Action” to members of the University community at her State of the University address. That “Call to Action” has now been formalized in a memorandum from the Provost, Carl Amrhein. 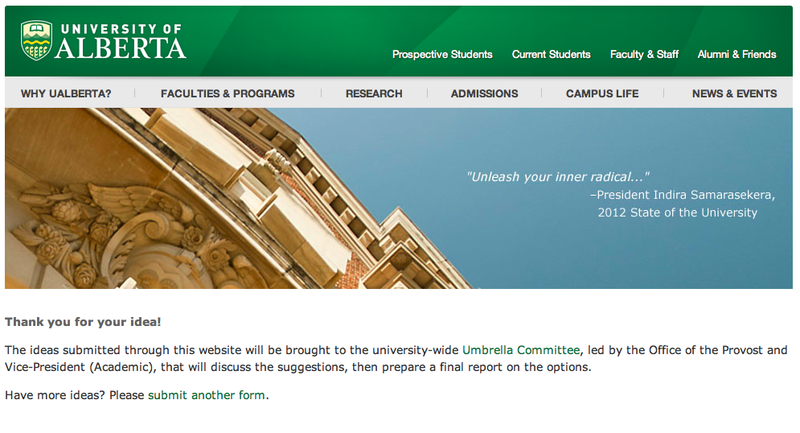 The Administration invites the University community to submit ideas for how the University may be reorganized at the following intranet website: https://umbrella.ualberta.ca. We are indeed, as Professor Amrhein’s memorandum asserts, “a community of smart, creative people” that may indeed wish to “make the most of this opportunity [to] harness that creative and intellectual power [by which we might] reinvigorate, rethink, and reimagine the university.” It is disconcerting, however, that the website has not been set up in such a way that we can share our ideas with one another. If those contributing their ideas could view the ideas submitted by others either before or after submitting their own, we would have the opportunity to build on one another’s ideas. The space would then be a virtual one in which our “inner radicals” could get together, and converse, and the ideas that would result might very well be better than any one of us could come with up on our own. Perhaps the Administration will consider revising the virtual mechanism through which it is soliciting our ideas. It would be wonderful if it to chose to pursue the “inclusive and transparent” process it calls for by offering a forum for exchange in which we could see, respond to, and build upon one another’s ideas. But no matter whether the Administration chooses to revise the formal mechanism through which it is gathering our ideas, all members of the University community are welcome to use this space to share their ideas informally. Please also feel free to send along a copy of any idea you submit to “Umbrella,” which can be archived here for open reading. Here we might also explore ideas of how to challenge the “current fiscal realities” that we are told necessitate the reorganization of the University. Albertans have received of late financial analysis from more than one source that argues that the “current fiscal realities” driving this reorganization of the University would be very different if the Government of Alberta were to charge higher royalties on the province’s material resources in the form of bitumen, natural gas, and oil. See, for example, the report issued last week by the Parkland Institute at the University of Alberta, “Misplaced Generosity: Update 2012”: http://parklandinstitute.ca/research/summary/misplaced_generosity_update_2012/. With higher royalties — even royalties that were just a couple of percentage points higher — the Government of Alberta would have significantly higher funds at its disposal to fund public services including our healthcare system, our elementary and high-school classrooms, and our post-secondary education system. Whether you want to release your “inner radical” in relation to the plan to reorganize the University, the question of how the Government of Alberta is managing public resources including the University, or indeed any related issue, please, please feel free to share your ideas for how we might do so here. True creative strength lies in the sharing of our ideas. So, please, come on in! This space is not enclosed, but open — to all members of the University community, and, indeed, to all Albertans. The University belongs to all of us. For formal archiving of ideas formally submitted to Umbrella, please send the text along to artssquared@gmail.com, and we’ll set up a pull-down menu above for those files. The comment box below is of course wide open . . . . This entry was posted in events and tagged carl amrhein provost university of alberta, indira samarsekera state of the university address, parkland institute, parkland institute report "misplaced generosity", university of alberta. Bookmark the permalink. Thanks for inviting dialogue here. To the Provost’s Office: setting up a crowdsourcing website (questions, suggestions, conversation about suggestions, ability to express agreement or disagreement) ain’t rocket science anymore. See, for example, http://web.mit.edu/rgoodspe/www/papers/RGoodspeed_Crowdsourcing_Handout.pdf or use The Google to discover thousands of precedents and hundreds of resources. And really, Provost/President: if you want inner radicals released, and a sense of collaboration around a tough challenge (rather than demoralization at what feels like another charade of collaboration), a crowdsourcing website is a very low bar. If you want to be top-something-by-something-something when it comes to collaboration, google “University of Alberta” and “Citizen Involvement” or “Deliberative Democracy” and talk to one of the many experts at your own University who specialize in this kind of thing. It worries me that as the University community is not allowed to see what suggestions are submitted, unverifiable assertions as to their content may be made when the report of the Umbrella Committee is publicized. It’s very reminiscent of the reassurances offered about the effectiveness of “quiet advocacy” — advocacy of a special kind, that can only happen behind closed doors, that in fact loses its effectiveness if described in any detail (so we are putting it at risk in even asking questions about it), but which we are assured is in all of our best interests. I have a feeling that the Umbrella Committee report is likely to represent its recommendations as having emerged from community suggestions, such that should there be any criticism or outcry it will be figured as the response of a vocal minority, the wishes of some invisible silent majority having been gathered from those contemplative “inner” radicals (as contrasted to the noisy “outies” among us) who (putatively) logged in and humbly offered their proposals in the proper spirit of modest decorum.